This bill revises the Family and Medical Leave Act of 1993 and federal civil service law to allow eligible employees (including federal employees) to care for an adult child, grandparent, or grandchild (as well as a spouse, child, or parent), if the care recipient has a serious health condition. This bill delays for one year the release of the Overall Hospital Quality Star Ratings, which is designed to help people, their family members, and caregivers compare hospitals in an easily understandable way. This bill amends title II (Old Age, Survivors and Disability Insurance [OASDI]) of the Social Security Act (SSAct) to improve the process by which the Social Security Administration makes disability determinations and awards disability benefits. This bill amends the Public Health Service Act to increase the permissible variation based on age for health insurance premiums for coverage offered in the individual or small group market from a factor of three to a factor of five, or to a factor determined by the state. This would apply to plan years beginning on or after January 1, 2018. This AARP Blog Thinking Policy story highlights how now more than ever, Americans, especially the elderly, are using Nutrition Fact labels when they shop for food. Correspondingly, the Food and Drug Administration (FDA) announced new Nutrition Fact labeling rules that food manufacturers must follow by July 2018. Some of the important changes that affect older adults in managing their nutritional health include the addition of added sugar, potassium, and vitamin D information, serving size updates, and that serving size and calorie information be in a larger and bolded type. This article from Forbes provides an overview of the policy platforms Hillary Clinton and Donald Trump have adopted regarding issues relating to caregiving and long-term care. The profile includes explanations of the presidential candidates’ positions on social security, taxes, and caregiving; respite care for caregivers; paid family leave for caregivers; and long-term care costs. This bill establishes the In-Home Supportive Services Family Caregiver Benefits Advisory Committee within the State Department of Social Services. The Committee’s purpose is to describe the availability of, and barriers to accessing, employment-based supports and protections for family caregivers. Moreover, the Committee will study the impact of the lack of access to these supports and protections on persons who provide supportive services to a spouse or as the parent of a recipient child. Illinois Governor Rauner signed a bill into law that allows employee family caregivers up to six months of earned sick leave benefits for providing care for a child, spouse, sibling, grandchild, in-law, grandparent, or stepparent. Another key provision of House Bill 6162 includes permitting employees to use their accrued six leave benefits for a family member’s illness, injury, or medical appointment. Accordingly, Public Act 99-0841 will go into effect on January 1, 2017. This bill provides oversight of Alzheimer’s disease and related dementia services so that people diagnosed with Alzheimer's or a dementia-related disease, as well as their families and friends, are better able to find appropriate services and care. This bill amends the Criminal Code of 2012 to impose new penalties against persons who commit identity theft or financial exploitation of an elderly or disabled person. This bill amends the Hospital Licensing Act to better coordinate the discharge of Medicare patients to post-hospital care, such that assessment documentation for pending discharges to a skilled nursing facility must be shared directly with the nursing home. This bill requires each hospital patient bill of rights and responsibilities to include a statement of the availability of a list of standard charges and participating health plans, and to identify a caregiver upon discharge. The Journal of Medical Oncology recently published research that involved assessing the association between family caregiver health factors (i.e., depressive symptoms) and perceived quality of care among patients with lung and colorectal cancer. Findings indicate that caregiver health and well being are associated with how patients with cancer perceive their care, with implications for quality metrics and provider reimbursement. According to this article from Home Health Care News, a recent pilot study approved by Harvard Medical School found that caregivers who utilize a short checklist about their patients’ conditions were able to report a number of changes that could result in more serious care interventions if left untreated—ultimately helping to reduce avoidable hospital readmissions. The checklist asked a number of questions such as, “Does the client seem different than usual? Has there been a change in mobility, eating or drinking, toileting, skin condition or increase in swelling?” If a caregiver notes any changes in condition, they receive additional questions and/or task prompts that allow care managers to determine appropriate follow-up actions for the patient. This article featured in The Gerontologist details the development of caregiver role scales among a sample of Mexican-origin female caregivers, based on the researchers’ formative research and Dilworth-Anderson’s Cultural Justifications for Caregiving Scale (CJCS) developed for African Americans. The researchers came up with four factors, comprised of six items from the CJCS and eight new items, and created the Caregiving Orientation Scale for Mexican-Origin Women (COSMOW), a new 14-item hybrid scale that includes more aspects of caregiving than the CJCS and provides a more comprehensive assessment of underlying cultural motivations for older adult care in this Latino subgroup. This report from Kaiser Health News reviews the results of a University of California, San Francisco study that found that low-income Californians who are elderly and disabled were less likely to go to the emergency room or be hospitalized after their in-home caregivers participated in an intensive training program. Caregivers were trained in skills such as CPR and first aid, and also received instruction regarding infection control, medications, and chronic diseases. On average, the rate of repeated emergency room visits declined by 24 percent in the first year after caregivers were trained; the decline jumped to 41 percent in the second year. This profile from the Washington Post describes how, across the nation, approximately 860,000 people ages 60+ care for someone with intellectual or developmental disabilities in their home. Also, many wait for years for state-provided Medicaid assistance (i.e., day services) for a disabled family member. If they cannot pay for these services on their own, under the federal-state Medicaid system, their family member could end up in an institution. While some states have passed laws allowing these older caregivers to help decide where and how the person they care for will live once they are no longer able to care for them, waiting lists for services are long, and state monies may not always be enough to provide for everyone who needs the help. Disability rights advocates insist that federal intervention, as well as increased support for informal caregiving and in-home care, are an integral part of the solution. According to this article from NPR, more than three dozen federal audits released in the past month reveal how some private Medicare plans overcharged the government for the majority of the elderly patients they treated, often by overstating the severity of certain medical conditions (i.e., diabetes and depression). There is growing controversy over the accuracy of billings for Medicare, which are based on a formula called a risk score, designed to pay Medicare Advantage plans higher rates for sicker patients and less for healthier ones. However, overspending tied to inflated risk scores has cost taxpayers tens of billions of dollars in recent years. Debate about the scale and frequency of future audits is ongoing, although the Centers for Medicare and Medicaid Services have said they plan to expand the auditing program in 2017. This report from Kaiser Health News highlights the plight of many elderly patients who deteriorate mentally or physically in the hospital, even if they recover from the original illness or injury that prompted them to go in the first place—research has found that about 33 percent of patients over 70 years old and more than 50 percent of those over 85 years of age leave the hospital more disabled than when they arrived. Consequently, many seniors are unable to care for themselves after discharge and need assistance with daily activities such as bathing, dressing, or even walking. How does this happen? Hospital staff often fail to feed older patients properly, get them out of bed enough or control their pain adequately; doctors might subject them to unnecessary procedures and prescribe redundant or potentially harmful medications. The unique needs of elderly patients are not always a priority for hospital administrators, but those that are able to devote resources to special geriatric units are often able to avoid these dramatic declines in patient recovery altogether. This mHealthIntelligence article covers a new Deloitte survey involving 3,751 participants, which demonstrates that while mHealth and telehealth are appealing to healthcare consumers, many are not using the technology. The researchers discuss how healthcare providers need to do a better job of educating consumers and caregivers about the benefits of these technologies. 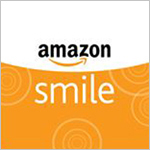 Some of the suggestions for making the technology more appealing by providers and technology companies are including caregivers, making the technology/service as seamless and easy to use as possible, and giving consumers what they want. In this Forbes story, Dr. Jason Karlawish, an Alzheimer’s disease doctor at the Penn Memory Center and the Healthy Brain Research Center, explains how his most powerful technology is asking patients and their caregivers what their typical day is like. He details how caregivers serve as “knowledgeable informants” that report on the health and well-being of patients with cognitive impairments. This report contributes to the stories that provide a personalized narrative that allows for a precise assessment of the patient's quality of life. Bloomberg Technology reports how a variety of startups across the nation are working on making family caregiving an easier task by using technology to automate caregiver-family matches, post customer feedback, and create schedules that make payments more convenient. Also covered are online marketplace companies that seek to match customers with care providers based on online profiles and those that employ caregivers and work directly with customers. The Elizabeth Dole Foundation is now accepting applications for its 2017 class of Dole Caregiver Fellows, which provides those caring for wounded, ill, and injured service members and veterans the opportunity to advise national leaders through the Foundation's network of public, private, and nonprofit organizations. Dole Caregiver Fellows also serve as spokespeople for their peers, elevating the nation's awareness of the contributions and struggles of the 5.5 million Americans caring for someone who has served. 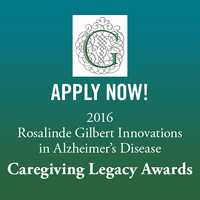 FCA, with support from The Rosalinde and Arthur Gilbert Foundation, is pleased to oversee the 9th annual Rosalinde Gilbert Innovations in Alzheimer’s Disease Caregiving Legacy Awards Program, which is accepting applications until Friday, September 16, 2016 at 5 p.m. (Pacific Time). The program promotes strengthening caregiving for people with Alzheimer’s disease, and encouraging innovation in this field by both recognizing and rewarding the efforts of those who lead the way in addressing the needs of Alzheimer's disease caregivers. One $20,000 award will be given in each of the following categories: Creative Expression, Diverse/Multicultural Communities, and Policy and Advocacy. 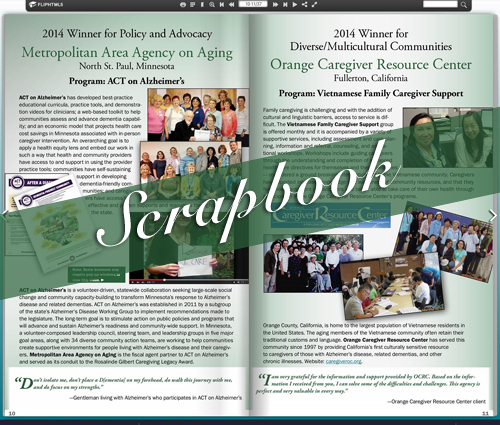 View FCA’s online scrapbook of past Caregiving Legacy Award winners 2008–2015.